Next time you complain about Half-Life 3 taking forever, consider this: the modern game of chess is believed to have originated in 1575, and only now is Chess 2: The Sequel coming out. And it's an Ouya exclusive. The game is by Ludeme Games and David Sirlin, a designer and game theory author who has offered his own balancing of multiplayer fighting games in the past. Chess is inherently a multiplayer game and its moveset has been rather rigidly balanced over the past 500 or so years. The site for Chess 2: The Chessening (sorry!) pulls out quotes from chess masters speaking to this, complaining that the game is mostly made up of memorized openings, mathematical solutions, and matches repeatedly played to draw. Chess 2: This Time It's Personal (sorry...) will solve this, Sirlin says. It "relies much less on memorized openings and more on positional play. There are fewer draws, and the asymmetric gameplay with mutliple matchups keeps the game fresh and interesting from the very first move." It will feature six different armies (one of them is not the Civil War set from the Franklin Mint), instead of the standard chess set. 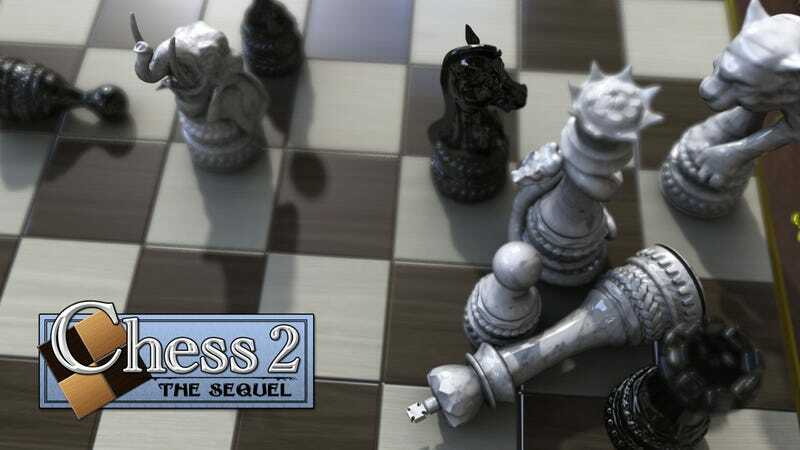 That means Chess 2 will involve 21 different matchups. "Longtime chess players and beginners alike will rejoice that that this makes memorizing an opening book impractical," Sirlin boasts. The game also adds a new win condition: Crossing the midline of the board with your king. "This makes the game very aggressive and practically eliminates draws from the game." Chess enthusiasts who are curious may see the rules of the game here. "It's been designed so that it's possible to play with a normal chess set," Sirlin notes, so with those rules, you may practice before Chess 2: Electric Chessaloo (sorry, sorry, sorry) releases near the end of 2013.